Smith River Alliance (SRA) and partners lead an effort to conserve the watershed of Goose Creek, the principal tributary to the South Fork Smith River. 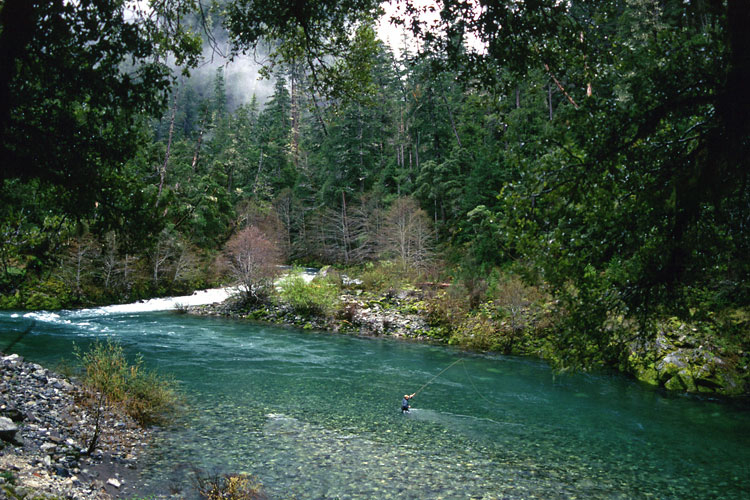 Purchase of these lands is vital to long-term protection of the Smith River ecosystem. 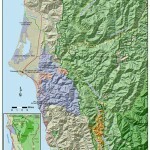 A 9,400-acre tract was added to the Smith River National Recreation Area (SRNRA) in 2008 . The SRNRA protects 450 square miles of watershed land managed by the Six Rivers National Forest and private landowners. Goose Creek drains 7% of the Smith basin. 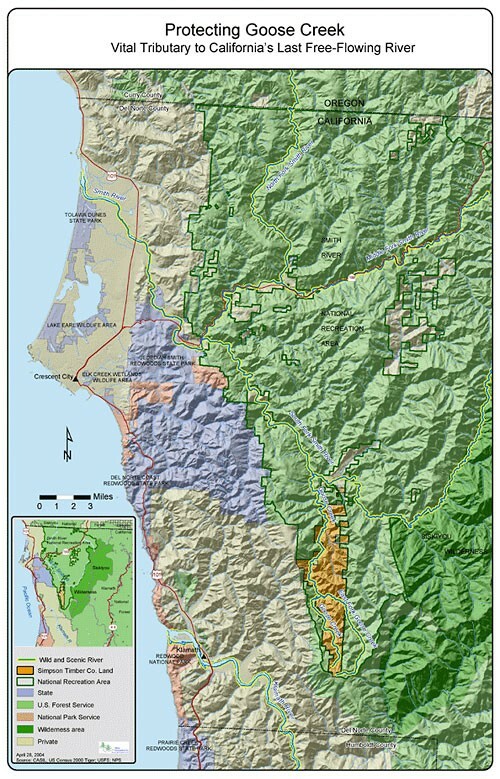 The Goose Creek watershed is densely forested, primarily with Douglas fir but also with white fir, western white pine, jeffrey pine, lodgepole pine, and ponderosa pine increasing at the higher elevations. Redwood is at its inland limit here with occasional specimens occurring along upper reaches of Goose Creek. Rattlesnake Mountain ridge, which is the western extent of Goose Creek, supports extensive stands of pine and chaparral. Seeps and springs supporting Darlingtonia Californica and other fern-associated species are found with frequency along the western slopes above Goose Creek from the mouth south to Red Mountain. Immediately adjacent to Goose Creek is a lush streamside corridor, which includes riparian species such as red alder, big leaf maple, Port Orford cedar, Pacific yew, and California bay. Goose Creek exemplifies the biological diversity of the Klamath/Siskiyou region. Its floral diversity supports a rich assemblage of mammals, birds, reptiles and fish including black bear, mountain lion, wolverine, northern spotted owl, endangered Del Norte salamander and tailed frog, chinook salmon, steelhead trout and coastal cutthroat trout. While the lower reach of the creek has high quality rearing habitat for salmonids, the upper reach is inaccessible to them and supports instead an abundance of resident fish. Goose Creek originates from a spring in Red Mountain Meadows at elevation 4,000 feet. For seventeen miles Goose Creek rushes and meanders through a steep valley and meets the confluence with the South Fork Smith River at elevation 840 feet. Over this entire reach, Goose Creek is a National Wild and Scenic River (as are the Smith and all its main tributaries). The Goose Creek watershed is good for fishing, backcountry camping, and mountain biking. Despite access difficulties, kayakers paddle two reaches of Goose Creek in order to experience the technical whitewater and wilderness-like setting. The Smith River Alliance and partners worked together to build public support for the purchase of the property which was completed in 2008.